Thanks for your interest in the version of Go Kart Cooling. 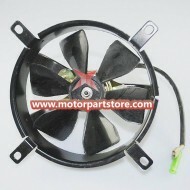 Our motorcycle parts is high performance. The Fan and cooling parts are stable. They are long service life. You need not to worry about the quality. please have a look.